Recognised as one of the most beautiful and authentic little Riad’s in the Medina. Great and willing Staff to serve and assist you. An unbeatable location inside the Medina Walls within easy distance to all main attractions without the noise and hustle-bustle keeping you awake all night! Riad Laksiba is located just inside the Medina Walls at Bab Ksiba. Walk through Bab Ksiba, take the 1st turn right (Derb Kadi) and you have arrived: simple. No fear of getting lost in the Medina labyrinth. Quiet cul-de-sac has no-through traffic and is a very safe neighbourhood for children and female travellers. Free Wi-Fi. 5 en-suite Double/Twin Bedrooms (but Riad Laksiba seems to work better with 8 Guests although it can accommodate 10). Daily Maid service/English speaking Guardian. Breakfast / Towels / Bedding included. Overnight Car Parking (opposite. Bab Ksiba). Sun Terrace. Splash Pool. All rooms are air-conditioned. Fully serviced with and staffed 24 hours. Simon Hawkesley is a designer and an author. Educated in England in Electrical, Mechanical, Industrial, Motor Vehicle and Domestic Engineering & Photographic Design, a natural talent for art, architecture and extensive experience in real estate, finance, historic property restoration/renovation. Simon has drawn and presented conceptual solutions on almost every inhabitable continent. Has also appeared on odd slots in property based Television programs across the world, writes occasional articles for Times Warner International Publishing on the same subject. Simon restored Riad Laksiba, his own pet project situated within a UNESCO World Heritage Site in the Kasbah district of the Medina Marrakech. For years my wife and I have been trawling the narrow streets (derbs) in the Medina, the old walled-in city of Marrakech, looking for a suitable location for a Riad to purchase. It dawned on me that I always chose hotels in the Kasbah district of the Medina, to set up Base Camp, whilst exploring. The answer, for "Where to Buy"?, had been staring me in the face from outset. The Imperial Kasbah. First Citadel of the Sultans of Morocco! The Kasbah is rich in community spirit, alive at night, has Royal Palaces, historic attractions and, moreover, feels safe. the thing we "bang on about" in the UK. It made sense to add some criteria. Quiet, easy to access and MOST to find. In 2010 Riad Laksiba enjoyed an entire restoration, in "Old Palace" style; (in keeping with the UNESCO World Heritage status) whilst being filmed for House Hunters International; an American TV Show dedicated to owners buying abroad. September 2010 the TV show was rolled out to a Global Network of some 97 Million homes. Now; regular repeats! 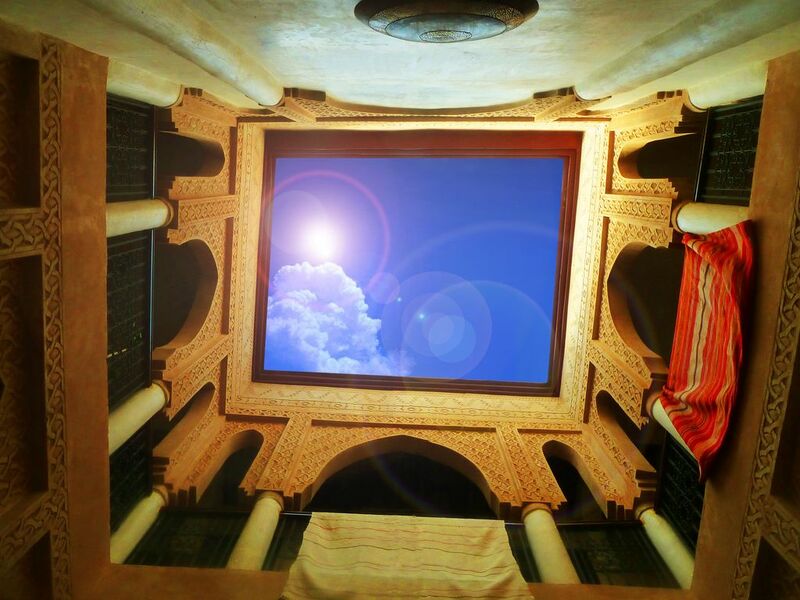 October 2010 we felt the Marrakech climate was right to "open the doors" of our special Riad home for guests to enjoy and sample the immediate community that has given so much pleasure. Amazingly our first guests came from as far away as Canada and Azerbaijan. The TV show "struck a chord" to many travellers visiting Europe who felt a budget trip to Marrakech could be squeezed in. Notes on accommodation: Quiet cul-de-sac has no-through traffic and is a very safe neighbourhood for children and female travellers. Free Wi-Fi. 5 en-suite Double/Twin Bedrooms (but Riad Laksiba seems to work better with 8 Guests although it can accommodate 10). Daily Maid service / English speaking Guardian. Breakfast / Towels / Bedding included. Overnight Car Parking (opposite. Bab Ksiba). Sun Terrace. Splash Pool. Outside: Ground floor patio and splash pool. Private roof terrace for sunbathing (cold shower and separate H/C Shower and Toilet on the Terrace). Distinctive Moroccan Chill-out mattress & cushions style zone, for evening Shisha-Pipe if inclined. Wow what a nice place to stay in. Safe, secure, clean with everything is right there on your doorstep. Yes, I suppose there may be better riads to stay in, but let me just say this. None of them will have Omar in. It was his totally non assuming, polite helpful way about him that made our stay just perfect. I'm not sure what the owner pays him but whatever it is, it's just not enough. Well done Omar my friend ! Yoga Courses, Moroccan Cookery introduction. Excursions available to the Countryside, Mountains, Coast. Overnight trips to the Desert and Essaouira (the seaside) can also be arranged. Camel Rides, Quad Bikes, Rafting, Tubing, Canyoning, Mountain Biking. We also have an exclusive association with a wonderful Riad in a great location in Essaouira (the seaside). Three and half hour interesting journey to the coast. As the Riad is built into the ancient ramparts, the Riad has the most amazing views of the Ocean from the roof terrace. A suggestion is to set off after breakfast, arrive for lunch, enjoy the beach and old medina and visit the fish market in the centre. Choose from catch-of-the-day and consume in-situ. Overnight, return after lunch. We can collect guests at Marrakech airport which is just a ten minute drive from the old town Medina via private chauffeur service. Riad Laksiba is located just inside the Medina Walls at Bab Ksiba. Walk through Bab Ksiba, take the 1st turn right (Derb Kadi) and you have arrived: simple. No fear of getting lost in the Medina labyrinth. Rue de la Kasbah is next to us, an arterial route to the Saadien Tombs, Kasbah Mosque, Royal Palaces, Agdal Gardens and, of course, the Jemaa el fna, main square and souks. Booking Notes: Please contact owner (Simon). DISCOUNTS AVAILABLE FOR EXCLUSIVE USE OF WHOLE RIAD Changeover Day: The Riad is fully staffed 24 hours and any arrival time/date is possible by arrangement. We will forbid you to bring any "Guests, friends, acquaintances" back day or night. It is illegal to entertain "locals" in a Riad. Riad Laksiba is designed for family holidays and is staffed 24/7. If you want to come, on these terms, then please submit to the Bookings process. If, however, you are looking for a Riad or Apartment that is not supervised then Riad Laksiba is possibly not suitable for you.